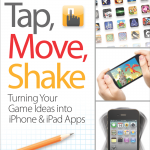 My new book Tap, Move, Shake is now available online and in stores. Just click the Books link at the top of the page to see how you can pickup a copy. And if you live in the Washington, D.C. area please join me at the MoDevDC book signing on January 11th. I hope to see you there! Update: All the book resources and source code has been published. This includes the math quiz, paddles (Pong game), Air Hockey, and Air Hockey with Computer AI. Please contact me if you have any questions. This entry was posted in Site on January 3, 2012 by todd.